Sahara Force India becomes the first Formula One™ Team to power its car by coffee. This new technology is a success in testing. Sahara Force India Formula One team has announced it’s swapping its usual F1™ fuel for locally produced, super-charged coffee. This could happen this season following the successful testing of a caffilytic converter. 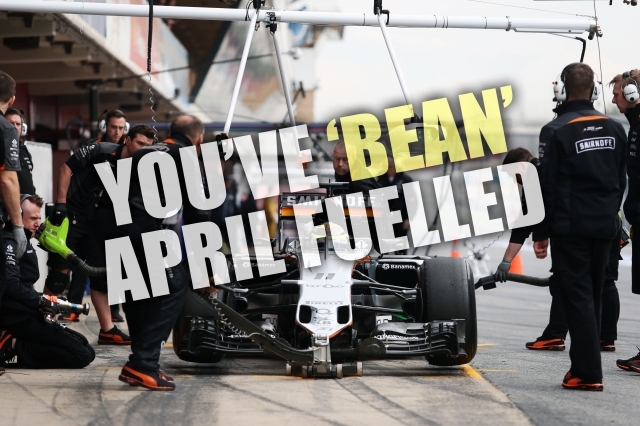 The new coffee-powered car is set to take to the grid at the forthcoming race in Bahrain on April 3rd . Being a break fluid usually enjoyed by the coffee drinking drivers when they are not on track. The Bella Barista brew is being used to help Sahara Force India’s driving stars secure a podium position. And it’s not just aroma, as British engineers broke the world speed record for a coffee powered vehicle back in 2011. Behind the scenes, Sahara Force India has been working covertly on this special caffilytic converter technology ever since. The team, who drink Bella Barista coffee, roasted in Northamptonshire, decided to pour the secret bean concoction into their car. This was a perk to help the new coffee car reach for pole position. Taking the coffee chequered flag, the new super charged vehicle will be unveiled on April 1st as a racing replacement for the remainder of the 2016 season. Sahara Force India Commercial Director, Stephan Curnow said: “The team is full of beans about being the first to get through the grind and onto the grid with a caffeine charged super car”. Bella Barista Director Claudette Porter spilled the beans about the exclusive new race deal. She said: “We are all so passionate about coffee here at Bella Barista and are delighted that Sahara Force India chose Bella Barista coffee as their fuel of choice on and off the track.